Ok, it is probably a bit of a stretch to say that Facebook creator Mark Zuckerberg is into possum living, but he is eating only meat that he kills. Not exactly in the way that Ted Nugent does it, but Zuckerberg does buy a live animal (goats, pigs and chickens, so far) and kill it himself before paying a pro to butcher it. Says Zuckerberg; "I started thinking about this last year when I had a pig roast at my house. A bunch of people told me that even though they loved eating pork, they really didn't want to think about the fact that the pig used to be alive," he said. "That just seemed irresponsible to me. I don't have an issue with anything people choose to eat, but I do think they should take responsibility and be thankful for what they eat rather than trying to ignore where it came from." I was pleasantly surprised when I read this. And I can understand paying someone else to do the butchering chore, for someone as busy as he obviously is. "So what do you need to do before zombies…or hurricanes or pandemics for example, actually happen? First of all, you should have an emergency kit in your house. This includes things like water, food, and other supplies to get you through the first couple of days before you can locate a zombie-free refugee camp (or in the event of a natural disaster, it will buy you some time until you are able to make your way to an evacuation shelter or utility lines are restored). Below are a few items you should include in your kit, for a full list visit the CDC Emergency page. 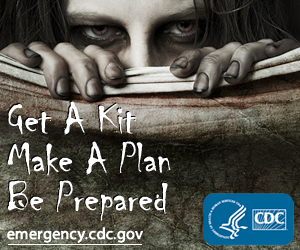 If zombies did start roaming the streets, CDC would conduct an investigation much like any other disease outbreak. CDC would provide technical assistance to cities, states, or international partners dealing with a zombie infestation." Thanks to The Urban Survivalist for the heads-up on this. I bought this 12 hp engine new about four years ago. I already had an S1100, and wanted to get another of the same design before the US government could ban their importation which, of course, they have since done. When I bought it, I started it once and ran it for maybe one minute. A few minutes before I shot this video, I disassembled the fuel filter and lines and double checked that there were no metal shavings or the like in there, then I started it and immediately shut it back down while bleeding the lines. So this video is the third time I have ever started it. After I shot the video, I started it again and ran it for 20 minutes. Right after I got it and before I ever started it, I removed the radiator and fuel tank. I wanted to have access to every part of the engine, plus you can really see the roots of the design with all that stuff gone. Also, when I got my S1100 I had a couple problems with it early on, and those problems were caused by the radiator and the fuel tank. I plan to put a decent-sized hopper on this one for cooling, and use a boat gas tank or something like that. I set my S1100 up for thermo-siphon cooling and a 55 gallon drum for a fuel tank. Note the pop-up oil pressure indicator at 3:43. If I remember correctly, it has pressurized oiling only to the valvetrain; with the bottom end being splash lubed. That is a good thing, actually, because all mechanical things eventually fail, and if the oil pump fails it would only increase wear to the rocker arms. Even at that, probably not much. After all, my Lister CS clone doesn't have pressure lubrication at all. You're supposed to lube the rockers when you start it, and every few hours while it is running. It might actually be an improvement on this engine to eliminate the oil pump altogether, and set up a gravity feed oiling system for the rockers. That would eliminate the parasitic drag of the oil pump thereby slightly increasing fuel efficiency, and it would eliminate the potential failure point of the rocker oil feed line, which could drain the oil sump if it developed a leak and I didn't catch it in time. These engines were very popular among off-gridders back in the 1980s and '90s. I read all kinds of articles about them in Backwoods Home Magazine, American Survival Guide, and other publications. I even have a book I bought back then called "More Power To You" that was all about using a generator based on this engine as the basis of an off-grid electrical system. That is why I bought the S1100, which I still have. I wish I could give you a link to where you can buy one if you want one, but our heroic government works diligently and tirelessly to protect us from anything that might serve to reduce our dependence, and this is yet one more "sharp tool" they have taken away from us.